Calamity has struck a peaceful fairy kingdom and it’s up to you to set things right in this enchanting match-3 fantasy adventure. An evil sorcerer has sucked all the magic out of Fantasyland, leaving it polluted and the magical inhabitants trapped. If you can’t clean up the landscape and bring back the magic, this could be the end for our fairy friends! Are you ready? You don’t have to do it alone! Four magic friends are here to help: the Wind Fairy, Fire Fairy, Lightning Fairy and Clover Fairy. With your puzzle-solving skills and their fantastic powers, there’s no obstacle you can’t overcome. 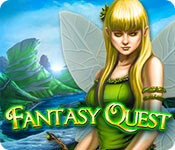 Fantasy Quest is rated 3.6 out of 5 by 14. Rated 5 out of 5 by bcmanx from Fairy fantastic Just loved this game. Great story line I like the fact that it is about the Eco system. We need to bring more attention to our own failing Ecosystem. Rated 5 out of 5 by AuntYorka from Relaxing is more what I would call this game I think relaxing and fun is the correct word used to describe this game. After a LONG hard day I like to sit down to a game that will relax both mind, body, and spirit. This game does exactly that and more. The game play is your usual match three however, there is challenge in the game. 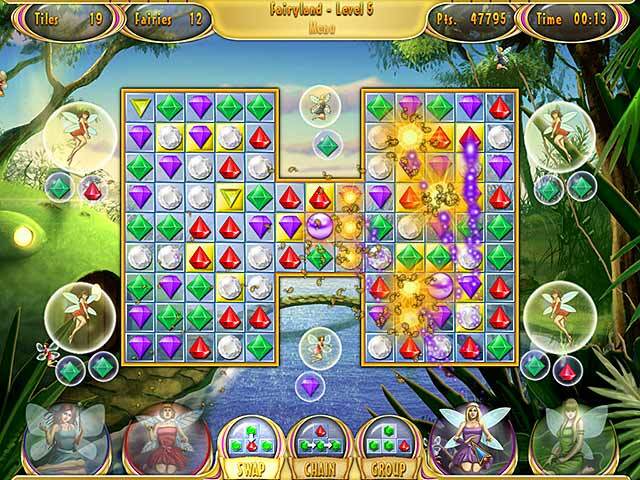 There are captured fairies that you must release by removing stones that match their... I guess you would call them locking stones. Some of the stones are locked within gold squares. These must be unlocked before you can release the stone. There are precious pearls that are yours to keep, but first you must clear their way to the bottom of the column they appear in. There are also puzzle games between each level. I used to make this type of puzzle game, so I appreciate seeing them in a modern day game. :-) The music chosen for this game is absolutely perfect! Close your eyes for a moment and you feel as if you are transported into their world, and have tinkling fairy's all around you. This is sooo relaxing. A perfect game for me. Give it a try. You might find that you'll enjoy it too. Rated 5 out of 5 by pennmom36 from Save the Fairies! I absolutely loved this match 3 game although I will admit it's a really easy game. A calamity has occurred, an evil sorcerer has sucked the magic out of the kingdom leaving the air polluted and as a result the fairies are ill and motionless! 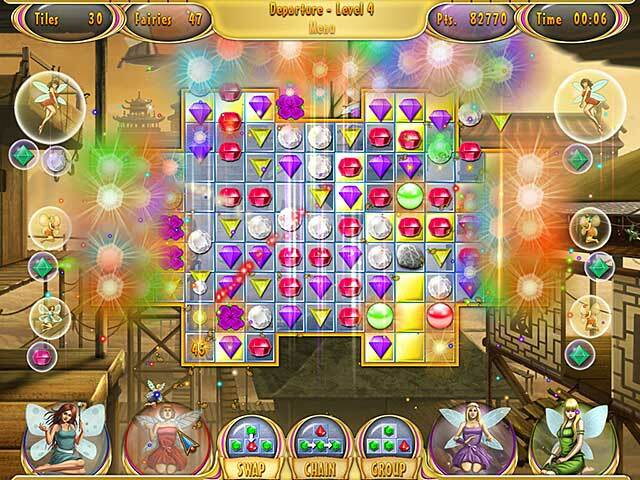 The object of each level is to "free" a certain number of fairies by making matches of whatever gems are shown under the bubbles with the trapped fairy. There are 3 different types of matches you can choose at the start of each level. The first is the classic swapping of tiles to make a match of 3 or more. The second method is making a chain of 3 or more by clicking and dragging adjacent tiles. The third method is clicking on groups of 3 or more. 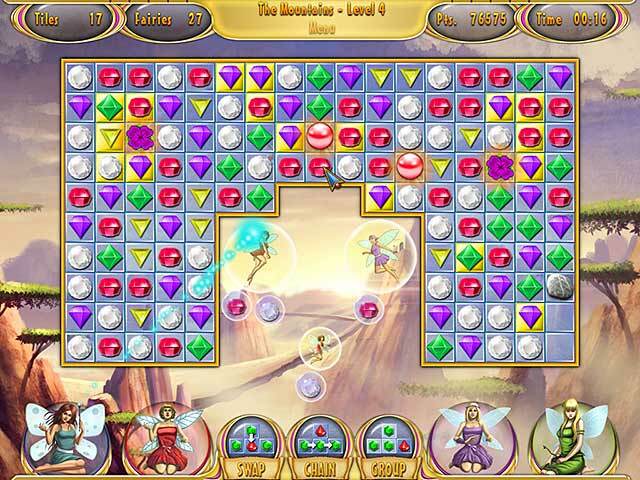 The level is completed by making matches over all yellow cells on the board. Each level will have different colored pearls that can be used as bonuses by making matches under the pearls until they fall off the bottom of the board. The white pearl represents the Wind Fairy which will clear a single cell. The red pearl represents the Fire Fairy which replaces all of the objects on the cells with different gems. The purple pearl represents the Lightning Fairy which zaps several random cells at once. The green pearl represents the Clover Fairy which tosses several explosive clovers onto the board. If you match 5 or more purple gems, a bomb will appear on the board and can be used anytime. There will also be the normal blocked tiles such as stone tiles which need several matches or a bonus bomb etc. to clear. If you don't like fantasy themed games, pass on this one because it's all about the bright colors and fluttering fairies, otherwise enjoy! Rated 4 out of 5 by winterstorms from relaxing This is another old man review. With my lack of patience and arthritis now I need a game like this. No real point to it, take as long as you like, cute fairies. Turned the music off and liked it much better. This game is a great way to forget how much food costs now. I enjoy it. Rated 4 out of 5 by denniann2 from a relaxing M3. i played in an easy level and had no trouble finishing the game. 12 levels with 10 sub-levels. 120 in total. not hard at all!!!!! sometimes a little forward thought is needed. Rated 4 out of 5 by Serf2CavSpaniel from Fun and Cheaper than tranquilzers Ok, when I'm in the mood for mental stimulation, I'm not going to reach for the M3's in my Game Manager. When I'm in need of a relaxing, soothing, no grey matter required click-a-thon, though, this sweet little game fills the bill brilliantly! Now, granted, the story-line is sorely lacking in originality, but everything works as it should, there are three choices of M3 gameplay, the sound effects are spot on with the volume being adjustable so it was never annoying, and there is no waiting for one group of tiles to pop and fall before sliding the next bunch. And...there was no timer! Yippee! All of the familiar powerups and road blocks are there, and the powerups are introduced early on, which makes the gameplay pleasantly easy for those of us who enjoy M3s as a low-pressure form of relaxation. The Fairy theme is maintained thoughout, making this a very girly game and quite suitable for the Princess set as well as fantasy loving old hens like Yours Truly. I got about half way through my hour's trial and decided the game was well worth spending a coupon to own. If you are an M3 fan, give the trial a spin and see if it works for you. Rated 4 out of 5 by DrDavid from An easy and fun M3 Fantasy Quest is a fairly easy to play M3 with lots of sound effects and some odd power ups which I have not tried. Initially I was a bit put off with some of the rules of play but after a few levels and rereading the rules I figured out how to play this game and have fun with it. There is a timer, but it only factors into the points given at each level and the points mean nothing, so it is essentially an untimed game. Nothing difficult, just fun. Rated 3 out of 5 by SockTrollQueen from It was okay. As match 3 type of games go this was pretty run of the mill. It was not horrible. But I was kind of bored. Basically you are cleaning up an evil wizard's pollution and saving fairies that have fallen ill. That is the basic story-line. The music is okay, although after a bit it got annoying, but you can adjust the music volume and the sound volume. The colors are bright enough. Visually it is appealing. you can opt out of full screen and opt out of the custom cursor. The challenge level seems to be easy. I only have the demo to go by, so maybe it does get more difficult. I personally will not recommend it, try the demo, maybe you will disagree. Rated 3 out of 5 by fredandethel from Not as good as Bumblebee Jewel The game opens with no screens to show who the developers were, but the general appearance is so like Bumblebee Jewel they must be from the same studio. A nice feature is that you can choose between swap, chain or block, and even change your mind in the middle of a level, but I'll stick to the Bumblebees.